President Donald Trump's choice of Larry Kudlow to be his chief economic adviser might seem a bit of a head-scratcher at first. Kudlow was chosen Wednesday to replace Gary Cohn, a free-trade advocate who led the internal opposition to Trump's tariff proposals on imported steel and aluminum. Kudlow, a CNBC senior contributor and on-air personality, has also been a staunch advocate of free trade and an opponent of tariffs. That threatens to create a conflict with Trump's protectionist views on day one. But Trump says Kudlow now agrees that the threat of tariffs can be used as a bargaining chip to force all sides to the table. "We don't agree on everything, but in this case I think that's good," Trump said Tuesday. "I want to have different opinions. We agree on most. He now has come around to believing in tariffs as a negotiating point." 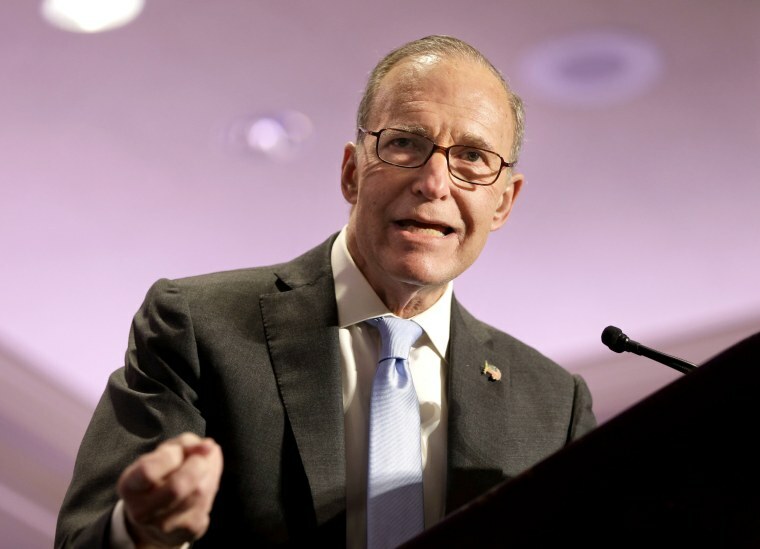 While the president said he would welcome disagreement from Kudlow, other cabinet members with dissonant views from Trump have been shown the door. Trump fired Rex Tillerson as Secretary of state via tweet this week, just one day after Tillerson condemned Russia for its alleged involvement in the poisoning of a British spy. Trump also disposed of an undersecretary of state who had contradicted the White House's version of how the layoff occurred. The new top economic adviser said Wednesday on CNBC he was "honored to take the job" and related the series of thirty minute phone calls he had over "three to four days" in advance of being offered the position. "He was wonderful," said Kudlow, "it was a terrific experience," and lauded Trump's handling of the economy. "The economy is starting to boom, the tax cuts are working," and infrastructure development is in the wing, he said. Kudlow also praised the president for his leadership. "He's completely in command. Not only does he explain things he's thinking, he asks questions," said Kudlow. "He's a smart man. Kudlow may agree with Cohn's opposition to tariffs in principle, but the difference is that he's willing to get on board for the greater good. The nominee "has been a spirited cheerleader for conservative, low-tax/supply-side fiscal policies, regardless of past experience or painful facts that stare the rest of us in the face," said Gary Burtless, an economist with the Brookings Institution. In his early years Kudlow worked on Democratic campaigns and those of future conservatives. He worked as a staff economist at the Federal Reserve Bank of New York and was part of the Reagan administration as an associate director in the Office of Management and Budget. Later he worked as an economic counselor and sat on the board of companies that advocated for lowering taxes and decreasing regulation. "Since Kudlow has been critical on-air of the president’s decision to back trade tariffs, and on trade generally, the commentator and former Reagan administration staffer seems at odds with the rising influence of trade adviser Peter Navarro and the president's statements," said Mark Hamrick, Bankrate's senior economic analyst, in an email. While acknowledging the experience of the nominee for the top economic slot, Hamrick said that now the stakes are higher than what Kudlow has faced in the past. "Unlike television where on-air conflict is sometimes mostly for show, the health of the national and global economy is at stake here," said Hamrick.